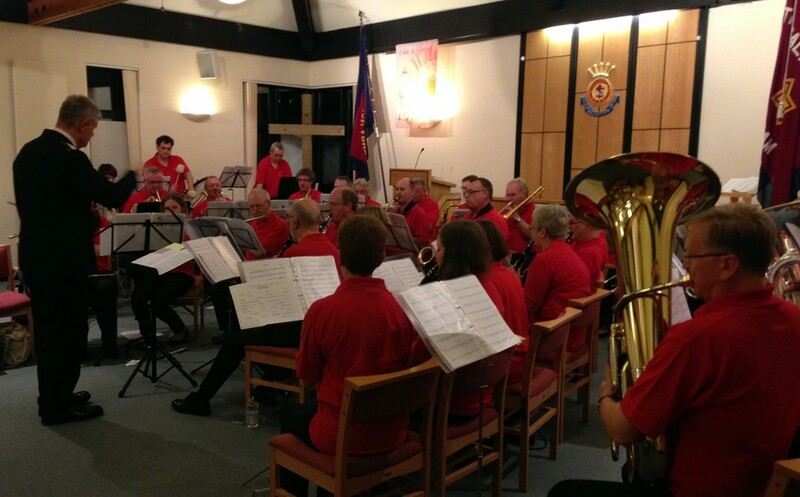 As part of the 130 years Celebration of Worthing Band the Salvation Army Symphonic Wind Ensemble (SASWE) presented a programme music and witness under the theme of ‘Day by Day’. SASWE provided an evening of contrasting musical arrangements to a large appreciative congregation many who were hearing the ensemble for the first time. 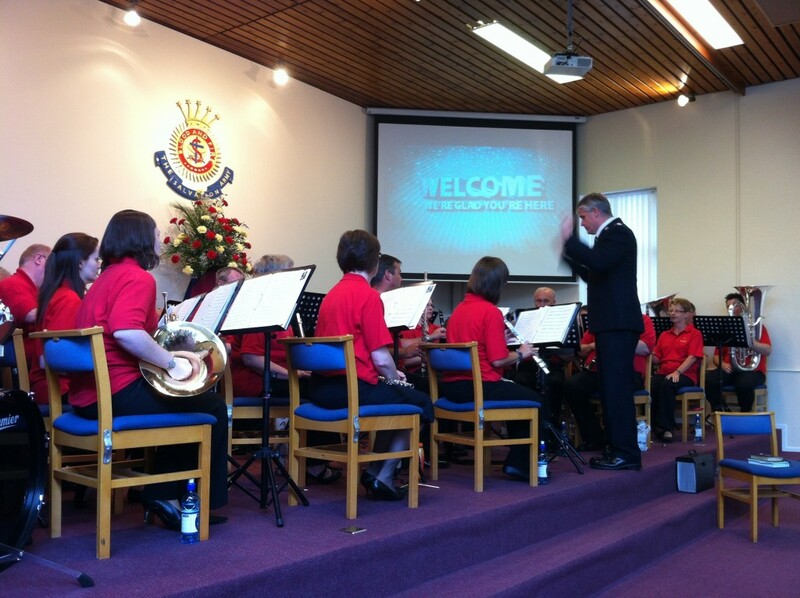 The music included arrangements of Salvation Army band items as well as items written specifically for the ensemble. This included Daniel and Let the Children Sing. A former member and composer for SASWE, Retired S/Ldr Michael Babb, conducted a new arrangement of God so Loved the World. 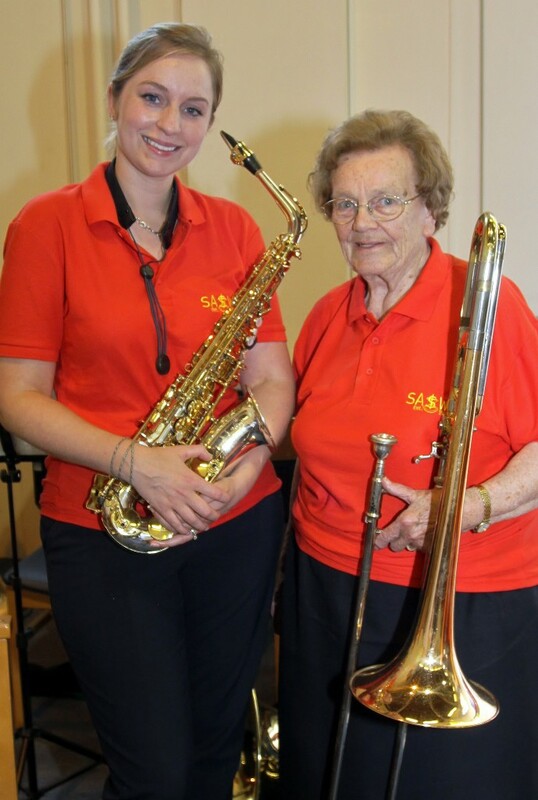 Maisie Ringham Wiggins and Saira HallDuring the evening a presentation was made by Joseph Greenwood and Daniel Bannister, the newest Worthing YP Band members, to Maisie Wiggins MBE, who is still a member of the trombone section and celebrating her 90th birthday. To the delight of the congregation BM Andrew Mackereth played on an old wind up gramophone a 78rpm recording of Maisie playing the trombone solo A Never Failing Friend. Maisie Ringham Wiggins and Saira Hall – Maisie is our eldest active member, and Saira is our newest regular performer. The people of Horsham were fortunate to receive a return visit from the Salvation Army Symphonic Wind Ensemble (SASWE) for a programme music and witness on Saturday 5th Under the theme of ‘God On Our Side’ SASWE presented an evening of contrasting musical arrangements closing with ‘Let the Children Sing!’ an arrangement by Andrew Mackereth of the music of the late Alan Laken, founder member of SASWE who has family connections with Horsham. The Bible message, given by Peter Bale brought together thoughts from the words associated with the music focusing on how God reveals himself to be alongside us and helping us overcome even when the challenges seem insuperable.Congregational singing to the rousing accompaniment SASWE provided was highly enjoyable and the audience also appreciated the relaxed, entertaining style of Musical Director, Andrew Mackereth, who was an excellent compѐre. The vote of thanks was given by Horsham band leader, Mervyn Tarrant, who confessed that, as a dyed in the wool brass band enthusiast, his expectations of the evening’s music had not been high. How wrong he was! Mervyn is now a complete convert to the excellent witness and enjoyment provided by the musical arrangements for woodwind and brass which SASWE perform to such a high standard. It would be unfair on other Corps who haven’t yet had the pleasure for Horsham to ask for SASWE to visit again soon but it would be wonderful. Having been brought up on a diet of brass band music, I wasn’t sure what to expect from your group. Wind ensembles isn’t something that I often listen to and I was intrigued as to how music written for brass bands would work for such a group. I now can’t believe I even doubted it. I just want to say how much I enjoyed your weekend in Lurgan. I loved the obvious sincerity of the group and the fact that you enjoyed and meant everything that you did. I can only imagine how difficult it is for people who aren’t able to use their prefered instruments within SA brass bands, and for them to have this opportunity is just fantastic. The ministry of the Sunday morning meeting is something that I will remember for a long time. I have several musical highlights from the weekend also. Some of the sounds produced from the ensemble especially during the more major works were superb but for me the highlight of the weekend was undoubtedly the playing of Power of your Love. The emotion I felt during the playing of this piece is something that I would love to bottle. I think I have gone on long enough but I wanted to express some of my thoughts and feelings about your group and their visit. Hopefully the ensemble continues to proclaim the gospel in this way and I pray that God will help you to bless many more people through your “Songs of Praises”. Members of The Salvation Army wind ensemble began to gather at Reading Central premises at 1.00pm on the day of the concert, some travelling considerable distances, thus displaying their commitment to the ensemble. After practising for 3 hours they were ideally prepared to present a most enjoyable and at times challenging evening. The local arrangements of the event were undertaken by Retired Bandmaster David Mortlock, and in his opening remarks, Andrew Mackereth, the Musical Director of the ensemble, paid tribute to the organisation which had been so helpful in the group settling in and preparing for the concert. The ensemble was made up of orchestral brass and woodwind instruments. The music presented included rousing arrangements of Salvation Army band items, as well as items written specifically for the ensemble. Amongst the former were included Edward Gregson’s variations on Laudate Dominum which was enthusiastically received. The audience proved to be both appreciative and sensitive in that the atmosphere created by more reflective contributions were acknowledged in silence, amongst them “To him belong” written by a founder member of the ensemble Alan Lakin, and “On Eagles Wings” by Rob Wiffin. Michael Babb’s ten year membership of the ensemble was recognised during the programme, before he introduced his own composition written especially for the ensemble based on the song “In Christ Alone” which he entitled “The Love and Power of Christ”. The arrangement beautifully exploited the orchestral tones of French horns and woodwind, not often heard in Salvation Army meetings. This performance was also appreciated in silence. Maidenhead Songsters under their leader Graham Gray supported the programme and provided some most sensitively performed contributions, which toward the end they contrasted with more robust numbers “Swinging with the Saints” and “Blessed be the Lord” featuring Songster Carol Gray as the soloist. This proved to be an admirable prelude to Self Denial Sunday for which the leaders were Majors Stephen and Heather Poxon from THQ. Major Stephen’s message on the Gospel of the second chance brought mercy seat responses, and Major Heather, used here experience of living in Africa to challenged the congregation to be generous when contrasting on how little Salvationists abroad have to exist, yet how fulsome they are in their praises to God.